In the Reports area in eLab, select the Content Tracker Report and then select the course (section) to view. Select all students or an individual student. A list of all selected students will be provided. The screen report will show how much of the various resources in the content area have been viewed by the student(s). 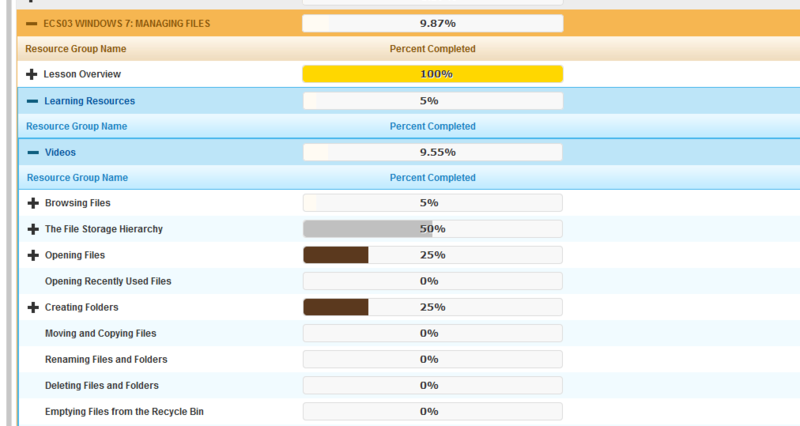 At the top level, you can see what percentage of the total course resources have been viewed by the student. Then drill into the data for an individual student to see the percentage that was viewed for each unit and each individual lesson. The lesson view can then be expanded to see each individual resource in the lesson and whether the student viewed that resource. ECS03 resources, 100% of the lesson overview, and 9.55% of the videos. When Videos is expanded, you can see each video and what percentage of the video was viewed by the student. When creating a test, you can use the Global Settings button (as exists for assignments) in step 1 of the test creation wizard. This will use your standard set up for the first page of test details. Settings for step 2 and 3 will still need to be done on a test by test basis. The test library is now easier to use when setting up a course by allowing you to select multiple tests at one time to add to your course. First choose if you would like to apply global settings to the selected tests. If you apply global settings, you will be able to make edits to the tests. You will be brought to the first selected test to make any edits and then click a Save & Next button to quickly move through editing the other selected tests. Note: edits to the test questions and settings from step 3 will still need to be made on a test by test basis. Select multiple tests in their course for editing. Only settings in step 1 of the test creation wizard will be able to be edited using this feature. Upon selecting the tests and choosing Edit, the settings available in step 1 will be displayed and can be edited. These edits will be applied to all selected tests. Now you can sort assignments on the main assignment page by the submission status. This will allow you to display assignments that have ungraded submissions at the top of the list eliminating the need to scroll through to pick out the assignments with submissions to grade. Add up to 25 assignments from library to a course. Option to apply global settings to all selected assignments. Instructors are asked if they want to apply the edits. Choosing Yes takes the user to the selected assignments. Save & Next moves the user through the remaining selected assignments. Allows instructors to make edits to a group of selected assignments. Examples include changing the assignment type, maximum point allotment, due date, and more. Ungraded resubmissions are marked with an asterisk on the current grade to notify both student and instructor. Previously on resubmitting an assignment there was no way to indicate that the current grade could change. Access the Concepts Review Quizzes from both the content area and the student test page​. Quizzes remain in the content area as well. Test page is automatically populated with quizzes on course set up. Instructors do not have to set required access point for quizzes. Display or hide individual category averages in the student gradebook. Option to display or hide the final course grade remains unchanged. Instructors can change the full test availability window (date available and due) for individual students, as is currently available for assignments. Use the Change Availability Window link in the test information section for specific students. The section will display the start and end dates for the entire class as well as for the individual student. Instructors may now use dashes and periods in the name of tests, assignments, and custom gradebook columns.